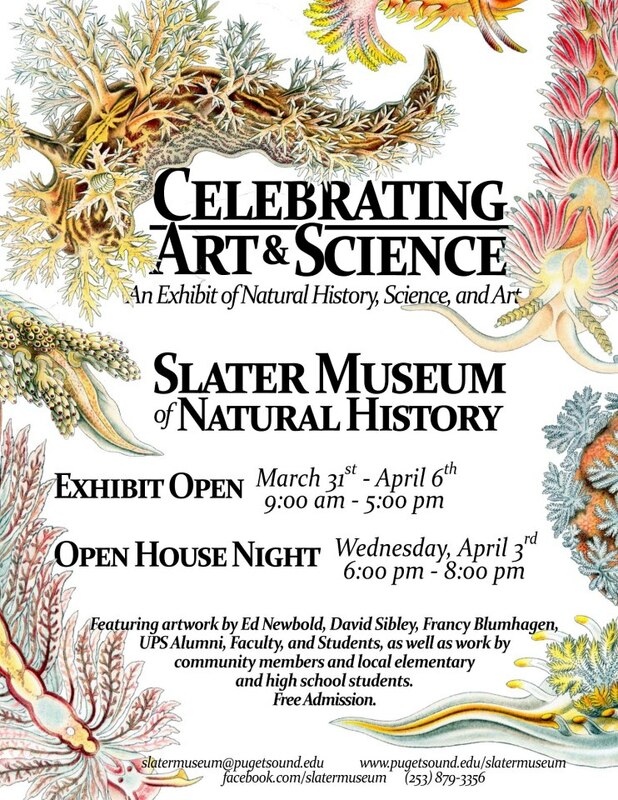 The Slater Museum of Natural History at the University of Puget Sound is presenting Celebrating Art & Science – an Exhibition of Natural History, Science and Art, March 31 – April 6, 2013. Don’t miss this fascinating cross-pollination of disciplines – and the chance to discover one of Tacoma’s hidden gems, the Slater Museum, with its hundreds of bird and mammal specimens. Free admission. For more information: facebook.com/slatermuseum. University of Puget Sound, 1500 N. Warner, Thompson Hall, Room 295. Following an inaugural event that attracted overflow crowds, the second Art+Science Salon—bringing scientists and artists together to discuss ideas, in line with a worldwide movement from New York to Hong Kong—will be held at Tacoma Art Museum, Thursday, April 18, 6–8 pm. Everyone is welcome to this free event presented by the University of Puget Sound and Tacoma Art Museum. The Art+Science Salon will feature Jackie Brookner, an eco-artist based in New York and a professor at Parsons, The New School of Design. 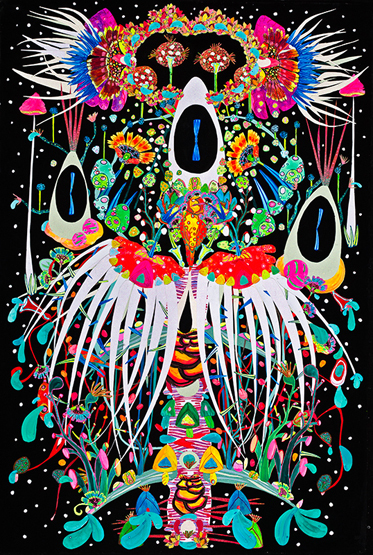 Brookner has created many artworks in collaboration with scientists and is currently working on a National Endowment for the Arts sponsored project creating community-engaged art in Fargo, ND. The salon will feature a panel discussion followed by a conversation about the collaborative process with scientists. This conversation will look into the concept of the individual, the many levels of organisms and worlds that reside within individuals, the separation between inside and outside, and the interfaces between these worlds. The audience will be invited to brainstorm ideas about altered perception, consciousness, and exploring these cosmologies. The Art+Science Salon has been initiated in Tacoma by a committee of professors led by Siddharth Ramakrishnan, a neuroscientist who joined the University of Puget Sound from Columbia University, Parsons New School of Design, and the Art/Sci Center at UCLA. For more about Art+Science at Puget Sound visit: www.pugetsound.edu/artsci. 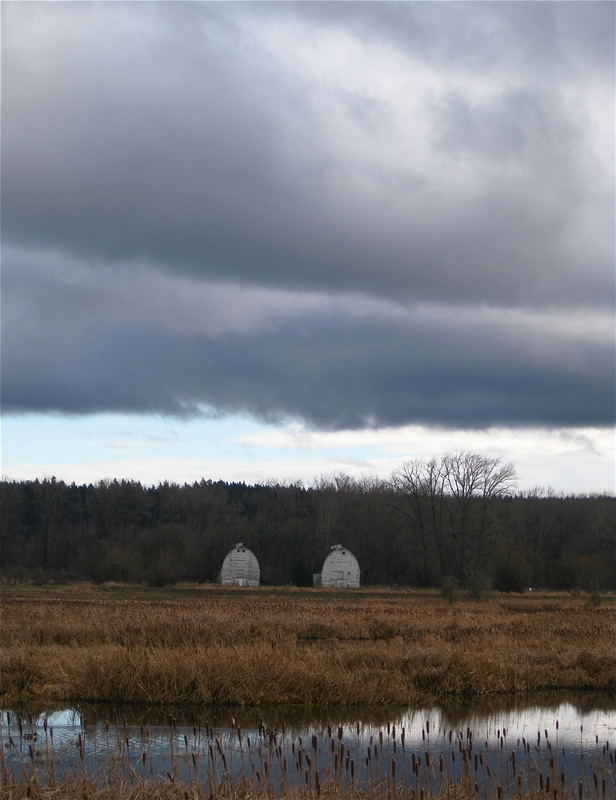 Information is also available by sending an email message to artsci@pugetsound.edu. Improv Workshop with Fiddler Mark O’Connor, March 30! Open to string players of all ages and skill levels – Improvisational and Creative Workshop for String Players with renowned fiddler Mark O’Connor, this Saturday 11 am – 1 pm at the University of Puget Sound, Schneebeck Concert Hall. This is a free workshop – bring your instrument! 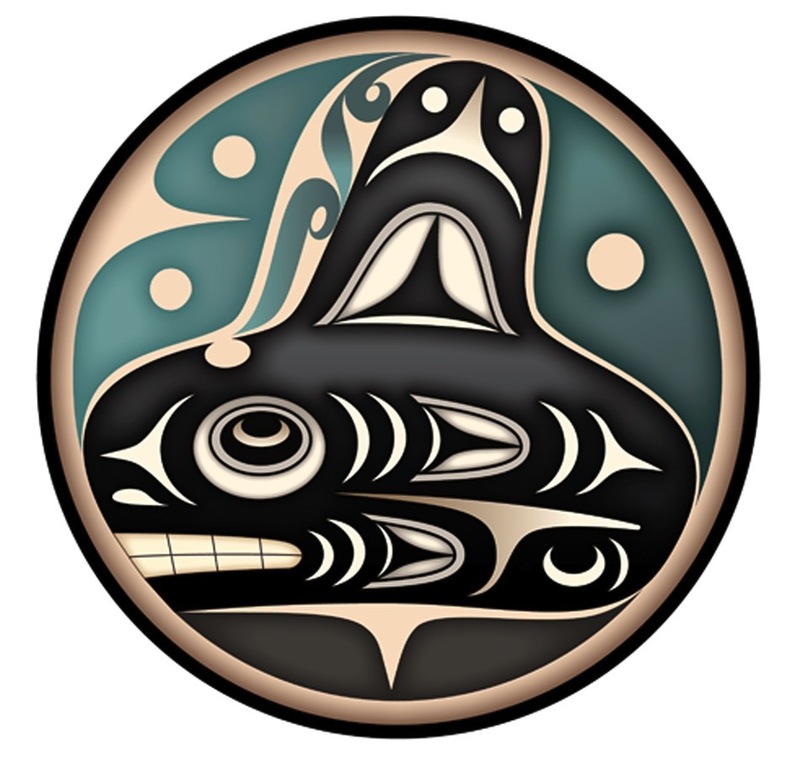 Join your statewide colleagues – including artists, administrators, educators, and cultural leaders – from across Washington for the 2013 Cultural Congress, April 22 – 24, at the Seattle Center. The Washington State Arts Alliance produces the Cultural Congress, a collaborative conference that brings together a diverse group of cultural leaders to strengthen skills and cultivate partnerships through intensive workshops, peer dialogue, and dynamic speakers. This year’s keynote address will be presented by Bill Ivey. Ivey is a respected author; has served as director of the National Endowment for the Arts, and was the founding director of the Curb Center for Art, Enterprise, and Public Policy at Vanderbilt University. The Congress will also feature networking opportunities, great discussions, and workshops on technology, advocacy, participation, and innovation. It’s a wow-packed conference that everyone in the cultural sector should attend. Visit www.culturalcongress.org for more information, registration, student pricing, and continuous updates. ArtsWA is providing scholarships for participants outside of King County – the deadline to apply is Friday, March 29. The Cultural Congress is supported by ArtsWA, 4Culture, Seattle’s Office of Arts and Cultural Affairs, The Seattle Center, Theatre Puget Sound, and the Boeing Company. Are you interested in teaching art classes at a Metro Parks community center? Then please submit the following information to Mary Tuttle, Senior Arts Coordinator for Metro Parks Tacoma, at maryt@tacomaparks.com. The Tacoma Arts Commission recently awarded $255,000 to nine Tacoma-based arts organizations through its Arts Anchor Fund program, and $40,000 to 16 Tacoma artists through its Tacoma Artists Initiative Program. The Arts Anchor Fund program awards range in value from $20,000 to $35,000 each, and the Tacoma Artists Initiative Program awards are $2,500 each. Funding for both programs is for the 2013-14 biennium. The 2013-2014 Arts Anchor Fund program award recipients are: Hilltop Artists, Museum of Glass, Northwest Sinfonietta, Tacoma Art Museum, Tacoma Musical Playhouse, Tacoma Opera, Tacoma Symphony Orchestra, Tacoma Youth Symphony Association and The Grand Cinema. In 2012, these nine organizations served 462,539 people, provided free admission to 76,021 people, and generated an estimated $8.82 million for the local economy.